Lions Hall, Russell Drysdale Street, East Gosford. 10am – 4pm, Entry – $5. Featuring a member’s display, raffle quilt, craft table and traders’ stalls. All profits going to charity. Guild Secretary, Nancy Parkinson presents the next Friday showcase at the Guild office at 10am on Friday, 3 October 2008. All welcome! Machine Embroideries from Emblibrary USA. Orange & Pineapples for Joy, Plums - gentleness, Lemons & grapes - patience. Olive for peace, strawberries - goodness, blueberries - self control, pears - faithfulness, peach - kindness. The next deadline for items to be included in the December 2008 newsletter is 8 OCTOBER 2008. The editor is always on the lookout for articles and photos of what quilters have been doing so feel free to contact her if you have anything to share. 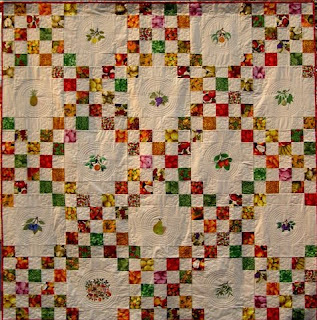 Is your quilt group holding a show or hosting a quilt-related event? Provide us with all the details and we’ll list it in the calendar. The first priority for our newsletter is to be a newsletter, reflecting the diverse and remarkable activities of our Guild and our members. Amanda discovered Fibonacci number sequencing and the golden rectangle a few years ago and was immediately fascinated. Photographers, architects and artists use it to create good proportion and balance in their work and it's a great tool for quilt designers. After much research Amanda now bases most of her quilt design on this very easy system. She says she is mathematically challenged but it's easy to understand how using this simple number sequence can help create better harmony and balance within a quilt. Whether you like traditional or contemporary quilts, Fibonacci number sequencing will make a positive difference to your quilt designs. If you don't design your own quilts you'll be able to use the information to slightly rearrange the proportions in the quilt patterns you use, to create a more aesthetically pleasing quilt. These two quilts embody Fibonacci design principles but you will design your own quilt. Download a workshop registration form and fax it to the office on (02) 9283 3274. Alternatively, you can telephone the office on (02) 9283 3737 to reserve your place. Following the success of the last dyeing workshop with Jane Gibson, members have another opportunity to colour their very own fabric to dye for. This one day workshop caters for beginner and advanced students. 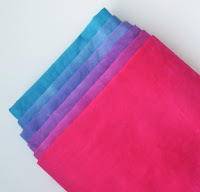 Particpants will work in small groups using Procion fibre reactive dyes on washed cotton fabric. In the workshop you will produce colour gradation with minimal measuring, a ‘run’ between two colours and a ‘cycle’ involving three colours and then several individual variegated pieces. You could process up to18 fat quarter pieces. Exquisite quilts on exhibition, trading table, hand & machine quilting. Demonstrations, viewer’s choice, quilt raffle, merchant stalls & refreshments. All profits going to local charities. “Come to the beautiful South Coast and experience a wonderful weekend browsing through our quilts". For more information, contactAnnette Arnould 02 4471 2193 or Jill Bennett 02 4471 1622. Dare to Differ 2008 is the seventh Dare to Differ exhibition of contemporary quilts held in Prospect Gallery in Adelaide, South Australia. Entries were selected by members of the South Australia Quilters' Guild from quilt makers all over Australia and includes works by Guild members Anna Brown, Dianne Firth, Alvena Hall, Judy Hooworth, Alison Muir, Brenda Smith and Carolyn Sullivan. The emphasis is on original and innovative work. The exhibition continues until 28 September but you can view the quilts online at the Prospect Gallery website. A selection of textile works inspired by Pamela Priday's recent visit to the Flinders Ranges will feature as part of a multimedia exhibition hosted by the Wild Lime Cafe in Blinman, South Australia from 12 September to 31 October in association with the annual A Brush with Art festival. You can view some of the works in Pamela's online gallery. Members please see your September newsletter (out soon!) for further details. The September 2008 newsletter is a bumper issue full of photos from the Quilt Show and other news. It will be posted out to Guild members soon so check your mail box. If you are not a Guild member, why don't you join today? Here is the membership application form. This reversible jacket is based on the oldest known garment, the "Bog Coat". The original was unearthed in a bog in Demark in 1000BC. It has appeared in many countries over the centuries, and it is still a versatile garment. Make your jacket in colours and fabrics to enhance your wardrobe, today. The jacket packs flat for travelling and provides those extra layers when the weather is cooler. Day 1: Create the fabric for the jacket using quick strip piecing techniques. Day 2: Assemble the quilt and perhaps wear it home!